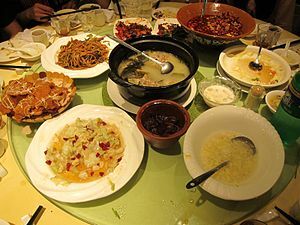 This is a list of Chinese dishes in Chinese cuisine. Fujian red wine chicken 福建紅酒雞 福建红酒鸡 hóngzāojī a traditional dish of northern Fujian cuisine which is made from braising chicken in red yeast rice. Double steaming / double boiling 燉 炖 dùn a Chinese cooking technique to prepare delicate and often expensive ingredients. The food is covered with water and put in a covered ceramic jar, and is then steamed for several hours. Red cooking 紅燒 红烧 hóngshāo several different slow-cooked stews characterized by the use of soy sauce and/or caramelised sugar and various ingredients. Stir frying 炒 / 爆 炒 / 爆 chǎo / bào two fast Chinese cooking techniques. Mooncake 月餅 月饼 yuèbǐng Usually eaten during the Mid-Autumn Festival. Sweet pastry with various fillings eg. lotus paste, red bean paste, mung bean paste. Most have a savoury egg yolk inside. Southern Guangxi cuisine is very similar to Guangdong cuisine. Northern Guangxi cuisine, such as the dishes below, is quite different. ^ a b Tan, S.; Press, B.F.L. (2012). Chinese Auspicious Culture. Celebrate Chinese Culture. Asiapac Books. p. 160. ISBN 978-981-229-642-9. Retrieved February 21, 2018. This page was last edited on 4 April 2019, at 01:36 (UTC).